Born in 1952 Jennie Slater studied Art & Design at SwindonCollege and subsequently gained a BA Hons in Drawing for Fine Art at Oxford Brookes University. Her interest lies in experimenting with both medium and style and although predominantly abstract, there is always a discernable motif from the visual world. Initially Jennie works in the open in all weathers painting small watercolours which forms the basis of larger work completed back in her studio. It is at this stage that she experiments with paint and other materials, rubbing, scraping and painting again to build up the layers of the picture. 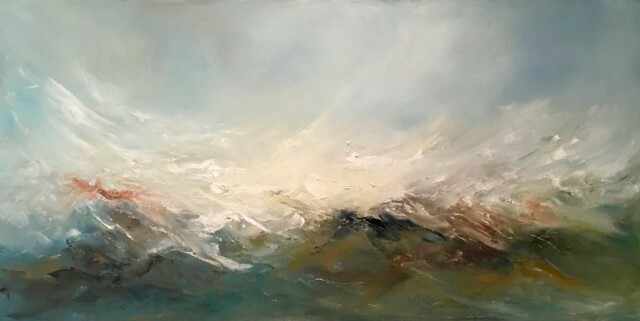 Jennie makes frequent trips to Cornwall to paint and her work draws its inspiration from the constant movement, the play of colour and light, so evoking an emotional response from the viewer. Her work has been exhibited widely at galleries in London and the south of England and at the Chelsea, Battersea and Hampshire Art Fair.